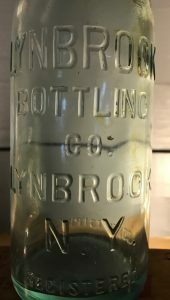 Lynbrook Bottling Co., Lynbrook, N.Y. The business, located at 336 Merrick Road in Lynbrook, was run by Abraham I Bate, an immigrant from Poland. 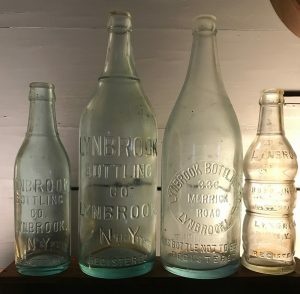 According to the Lynbrook Historical Society, it operated from 1922 to 1930 selling carbonated soda in towns along the south shore of Long Island. Based on limited records, it looks like the time frame is correct. The business was listed in the 1923 Lynbrook classified directory and Abraham Bate (Lynbrook Bottling Co) was listed in the 1928 directory (the only two directories I could find). In addition, Bate listed himself as a salesman for a bottling company in the 1930 census records. The business was located just west of the Five Corners, between Merrick Road and Langdon Place. Today the area serves as a bank parking lot. There’s a great story about the company’s demise on the Lynbrook Historical Society’s web page. Abraham’s son, Jack Bate who was 8 years old at the time, told the story. Back in the 1920’s all bottling companies used deposit-return bottles. Naturally, a big part of the bottling company’s operation involved washing out the returned bottles for their reuse. This meant water, lots of water. Up until 1928 the soapy water simply ran off the property to the south and west, ending in Doxey Creek. But in 1928 or 1929, one of Long Island’s first municipal parking lots was constructed, unfortunately just south and west of the bottling company. Since the soapy water could no longer run naturally off the property and because Lynbrook had no sewers, Jack’s father took the advice of a local contractor and at great expense built perhaps the largest cesspool Lynbrook has ever seen. Sadly it wasn’t big enough, the area continued to flood and the Lynbrook Bottling Company went out of business. 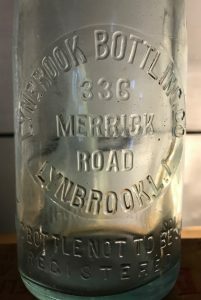 The bankrupt company’s entire stock of bottles, all bearing the embossed Lynbrook Bottling Company name, was sold to the New Haven Bottling Company in Connecticut who then re-named itself “the Lynbrook Bottling Company of New Haven”. It operated under that name until the 1970’s. I’ve found 2 different variants of the 8 oz size (custom mold and a 1920’s designer soda) and 2 different variants of the 27 oz size (slug plate and a custom mold similar to the 8 oz). The slug plate version includes the Merrick Road address. All are machine made which agrees with the dates the business operated.